Ladybug Flower Tower Game teaches strategy, stacking and dexterity. Carefully collect your ladybugs and add them to the tower, but don't knock it over. Older players can use the skills dice to challenge themselves while little ones learn sequencing, color-matching and balance physics. It is fun for the whole family. 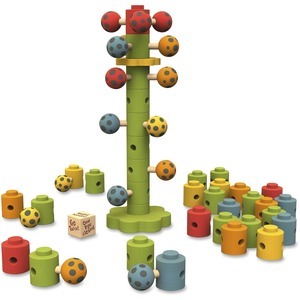 The game is made from eco-friendly rubberwood with child-safe stains. It is recommended for children ages 3 and up.